The Designated Emphasis (DE) in Science and Technology Studies (STS) provides training for U.C. Berkeley and U.C.S.F. PhD students from any home department in the social studies of science, technology, and medicine. Students who are accepted into the program, and who complete its requirements, will be in a strong position to excel within STS-related fields. Students in this program receive a rigorous grounding in the studies of knowledge production and technological change. The program also facilitates a deeper involvement with the lively interdisciplinary research community at U.C. Berkeley dedicated to understanding the dynamic relations among science, technology, and social and political formations. Science & Technology Studies has the capacity to forge new thinking and new collaborations at the intersection of the sciences and society. As a multidisciplinary field with a signature capacity to rethink the relationship among science, technology, and political and social life, Science and Technology Studies is particularly well placed to address the critical problems of the 21st century. From global climate change to the reanimation of race through genomics, from political movements galvanized through new media, to efforts to improve access to medicines for the world’s poor, the pressing problems of our time are simultaneously scientific and social, technological and political, ethical and economic. Given the complex nature of our world, entrenched disciplinary divides have become increasingly untenable as the basis for research, and for the training of scholars and social actors. Science and Technology Studies is drawing the interest of ever-increasing numbers of students and faculty because of its unique ability to help us understand the complexity of contemporary and historical problems, and because it can help us craft intellectual projects and modes of engagement that reflect this complexity more fully. Several generations of innovative work in the philosophy, history, rhetoric, and social studies of science and technology have generated influential languages, platforms, and methods for understanding the interplay between science, technology, and social-political formations – domains that are too often treated separately. This virtue is being recognized and reflected in the growing interest in the field: Science and Technology Studies is one of the fastest growing areas in the social sciences and humanities, nationwide and internationally. Disciplinary lines and research landscapes are starting to shift in directions anticipated by Science and Technology Studies. National directives now encourage the participation of social scientists in engineering research; medical schools increasingly require applicants to train in the humanities; and emerging fields such as ‘green chemistry’ demand heterodox approaches to thinking about environmental and social parameters, the properties of chemical substances, and shifting industrial horizons. Meanwhile, cutting-edge work in the humanities and social sciences has made science and technology central to the humanistic project, examining for example, the past and future of the book, historical and contemporary foundations of race and racial identity, or ethical debates over biomedicine and the boundaries of the body. Indeed, the humanities and social sciences are recognized as key fields from which crucial questions about science and technology emerge, helping us understand when and why particular research programs become dominant, attending to the effects and implications of new technologies and knowledges, and placing ethical and social inquiries at the center of scientific enterprises. Science and Technology Studies organizes and galvanizes precisely these kinds inquiries and approaches. 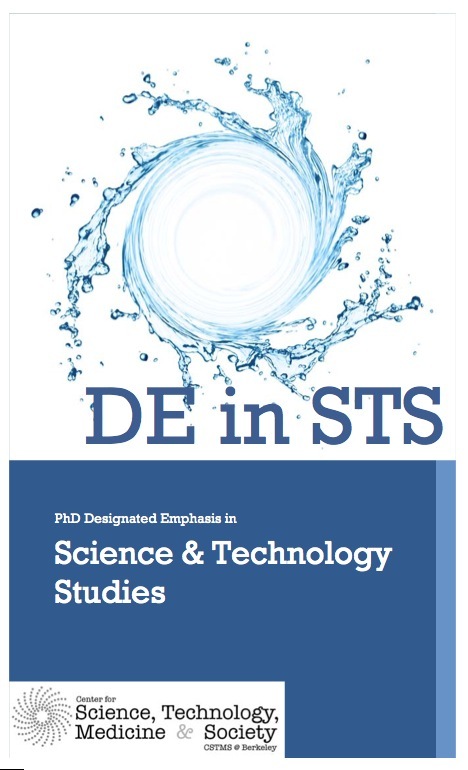 Prior to fall 2018, the DE in STS requires students to complete two core courses as well as three ‘breadth’ or elective courses during their PhD work, in addition to any requirements of their home departments. NOTE: starting with applicants in fall 2018, students must take at least one semester of the CSTMS Thursday colloquium (HIST/STS 290) as a third required class. Students admitted before fall 2018 are also strongly encouraged to take at least one semester of the CSTMS Thursday colloquium. We do not expect you to have completed all of these courses before you apply for the DE; you may take them as schedules and space permit. 1. STS 200: Science and Technology Studies: Theories and Methods. Usually offered in Fall term. This course provides a strong foundation in the interdisciplinary field of STS, with a focus on major theoretical trajectories, research methodologies, and new directions in the field. 2. STS 250: Research Seminar. Usually offered in Spring term. This seminar is for students within the DE who have completed their Qualifying Exams and have advanced to candidacy. Students in the seminar will develop their research and writing projects in the context of interdisciplinary collaboration and dialogue. Students are also required to take three elective courses that place a critical engagement with science, technology and/or medicine at their core. To foster interdisciplinarity, no more than two of these electives can be taken from the student’s home department. As a package, the three elective courses are expected to enhance the student’s capacity to understand and analyze how science and technology operate through and within ethical, historical, social or cultural formations. An indicative list of courses is below. Students may submit a non-listed course for consideration by the DE by completing the DE in STS Course Substitution Form to CSTMS. Your Ph.D. Qualifying Exam Committee must include at least one member of CSTMS’s Affiliated Faculty who will evaluate your knowledge related to the Designated Emphasis. Your PhD dissertation topic must be related to Science and Technology Studies, and your PhD Dissertation Committee must include at least one member of the Affiliated Faculty who can evaluate it from that perspective. You are also strongly encouraged, though not required, to be an active member of the History of Science / STS Working Group. Due to the interdisciplinary nature of training and research in the Designated Emphasis in STS, and depending on your background, completion of the DE could add time to your total program. Please note that no additional time can be added to your home department’s established normative “time to degree” to compensate for this. Applications are due November 1st each year. We advise interested students to apply at least 3 months before their PhD qualifying exams. The program is open to all U.C. Berkeley and U.C.S.F. PhD students in good standing with research interests related to the humanistic and social studies of science and technology, broadly conceived. Students may come from any discipline in the humanities, the social sciences, engineering, the natural and physical sciences, and professional schools across campus. Applicants will be selected on the basis of their academic qualifications, the appropriateness of their interests to the program’s teaching resources, and the enrollment capacity of the required courses. 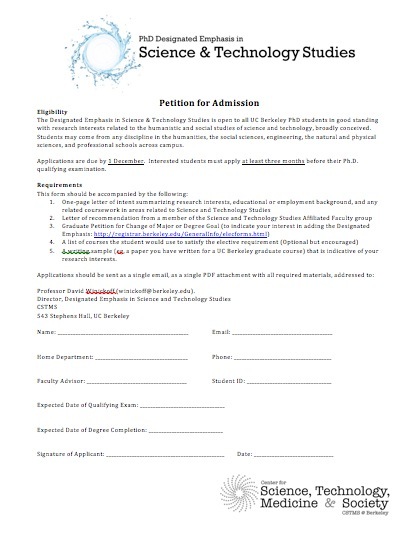 Graduate Petition for Change of Major or Degree Goal (to indicate your interest in adding the Designated Emphasis) (pdf). NOTE: though the Graduate Division has changed to e-forms for this process, please still submit this form to CSTMS for our records and for us to upload to your e-form petition should you be admitted to the DE. A list of courses the student would use to satisfy the elective requirement (optional but strongly encouraged). A writing sample (e.g. a paper you have written for a U.C. graduate course) that is indicative of your research interests. Upon acceptance by CSTMS, we will submit the e-form for your admittance to the DE to the Graduate Division. It is the student’s responsibility to ensure that they obtain approval from primary advisers and departmental staff, and that the DE is successfully listed on their course goals. The Graduate Division will ensure good standing in your home department, and upon graduation will ensure that you have completed the requirements for the D.E. In order to officially complete the DE, students must provide transcripts showing their fulfillment of all requirements. Transcripts should be sent to cstms@berkeley.edu clearly stating which courses are DE-relevant. For current DE students, grants are available for STS-related conferences and fieldwork. Please see the guidelines for more information.